“Jehad,” the Quranic concept of total strategy. Demands the preparation and application of total national power and military instrument is one of its elements. As a component of the total strategy, the military strategy aims at striking terror into the hearts of the enemy from the preparatory stage of war…Under ideal conditions, Jehad can produce a direct decision and force its will upon the enemy. Where that does not happen, military strategy should take over and aim at producing the decision from the military stage. Should that chance be missed, terror should be struck into the enemy during the actual fighting. …the Book [Quran] does not visualize war being waged with “kid gloves.” It gives us a distinctive concept of total war. It wants both, the nation and the individual, to be at war “in toto,” that is, with all their spiritual, moral, and physical resources. The Holy Quran lays the highest emphasis on the preparation for war. It wants us to prepare ourselves for war to the utmost. The test of utmost preparation lies in our capability to instill terror into the hearts of the enemies.”-from the book The Quranic Concept of War by Brigadier S.K. Malik. The book’s Foreword was written by Muhammad Zia ul-Haq, the then-President of Pakistan and Army Chief of Staff, and the Preface by Allah Bukhsh K. Brohi, the Advocate-General of Pakistan, and one-time Pakistani Ambassador to India. So the Pakistani Army Chief General Raheel Sharif tells India that terror against India will continue till Kashmir is surrendered to Pakistan, and if India tries to do something about it right at its source, Pakistan will impose unbearable costs on India. What are those unbearable costs Raheel Sharif is talking of ? In conventional military terms, India is fully capable of launching surgical limited strikes inside Pakistan to inflict damage on its terror infrastructure, without much loss to itself. If that leads to a full scale military conflict, India will come out a winner in that also. So what are those unbearable costs? A nuclear strike on an Indian city? Pakistan knows that India would immediately launch massive retaliatory strike, putting Pakistan out of existence. 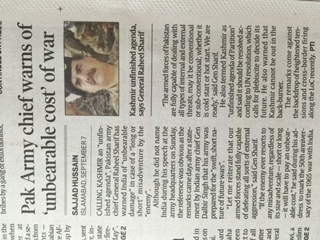 So even that is not the “unbearable cost” in the General’s mind. What is in the mind of the General is an illusion spurred by dangerous mix of faith, believed destiny of Pakistan, expected reaction of kafir India, and expected reaction of the international community led by the UN. And that illusion is that if Pakistan manages to kill just enough, but limited in numbers, kafirs of India; the remaining kafirs would surrender in terror. If they are not surrendering now, that only means that Pakistan has not killed enough of them. And to achieve this objective of killing just enough kafirs of India-enough to make India surrender- but not enough for India to launch nuclear strikes on Pakistani cities and/or international community to react against Pakistan – is to be achieved by the tactical nukes. And therefore there are continuous noises by Pakistani Defence experts about the Pakistani tactical nukes. These are the small yield Pakistani nukes developed by it to kill just enough Indian kafirs to make India surrender, but keep international community off the throat of Pakistan. To further make sure that the international community doesn’t react, it plans to use these tactical nukes on Indian army formations, thus totally crippling Indian army and terrorising it and Indians into surrender. Khaybar is repeatedly invoked on Pakistani news channels not because it was some great or crucial battle in itself, but because it led to a watershed event: after the massacre at and sacking of Khaybar, the Meccans surrendered without a fight, the Meccans who otherwise were holding out for over eight years. That is also why Pakistanis also believe that if somehow Israel is destroyed by the Arabs, Indians would be so terrorised that they would also surrender to Pakistan without a fight. And Pakistan hopes to achieve the same by use of its tactical nukes on Indian army. There is nothing India can do to change the mindset of Pakistani ruling elite that sees itself not just destined to enslave all the kafirs of Indian subcontinent, but fancies itself to be bound by and to be the instrument of Divine Command to do so. The US kept Pakistan safe when it had no nukes. The US also oversaw Chinese transfer of nukes to Pakistan. Real character of Pakistan has been revealed to the US only after the destruction of 9/11. But now it is too late for it to do anything about Pakistani nukes-tactical or conventional. It just doesn’t have the stomach to to be a Global policeman any longer. Indian ruling elite has also been dumb enough to neither destroy Pakistani nuke infrastructure itself, nor take Israeli help to destroy Pakistani nuke infrastructure right in the beginning, as Israel could have taken care of the both: Pakistani nuke infrastructure and US pressure. So now the options for India are very limited. Pakistan will continue to push terrorists into India. If attacked by India, it would surely nuke Indian army units and then ask international community to restrain India from nuking its population centres. Dhimmi Indian ruling elite may even buckle. And even if it doesn’t, the life in South Asia would end because nukes, tactical or otherwise, would make it unbearable for everybody. So it is a must for India to develop proper deterrence against Pakistani tactical nukes also. It must collborate with the US and Israel to render Pakistani nuke infrastructue useless in case the war breaks out between India and Pakistan. The best defence against any weapon is to render it obsolete. Pakistani nukes -both conventional and tactical-can also be rendered obsolete. But that would happen only if Indian ruling elite takes this talk of “unbearable damage” with the seriousness it deserves. The impression that violence and terror work is the most dangerous if it is gained by an elite like that of Pakistan that believes in Divine command to subjugate the kafirs next door. Therefore it is most irresponsible that India’s so called leading intellectuals-the columnists, editors, “celebrities,” academicians, novelists, activists, and the NGO crowd start talking of surrendering Kashmir to Pakistan every time Pakistan ratchets up violence. If India ever listens to these advocates of surrender, India would cease to exist. Because surrender of Kashmir would confirm in the mind of Pakistani ruling elite its two beliefs-that if enough terror is unleashed, kafirs surrender; and that its mission to subjugate India is indeed divine, that is why it is winning. So if we reward the bad behaviour-terror-we would have more of it, not less. Human beings do not get disabused of beliefs in Divine missions if they keep winning in those missions. India should on its own, or in collaboration with Israel and the US, develop systems to render all Pakistani nukes useless. And above and beyond that, it must believe, and must decide, and must make it known to the whole wide world, that if a single Indian, uniformed or civilian, dies in a nuclear attack-whatever be the origin of the nukes: State actors, non-State actors, near areas or any place in the world-not only Pakistan will be wiped off from the face of the earth, but also will be wiped off the face of the earth the country that gave it the nukes, the country that financed them, and the country that gave Pakistan the missiles. Every Indian heart and mind must have engraved on them:Live Free or Die. There is no other way to live as free born human beings next to those who think God needs them, instead of the other way round. Linking here does not mean that we agree with anything or everything posted on these websites or with their editorial or other policies, or views expressed thereon, nor we are responsible in anyway for the content on these websites.